Our traincar’s attendant watches people disembark. 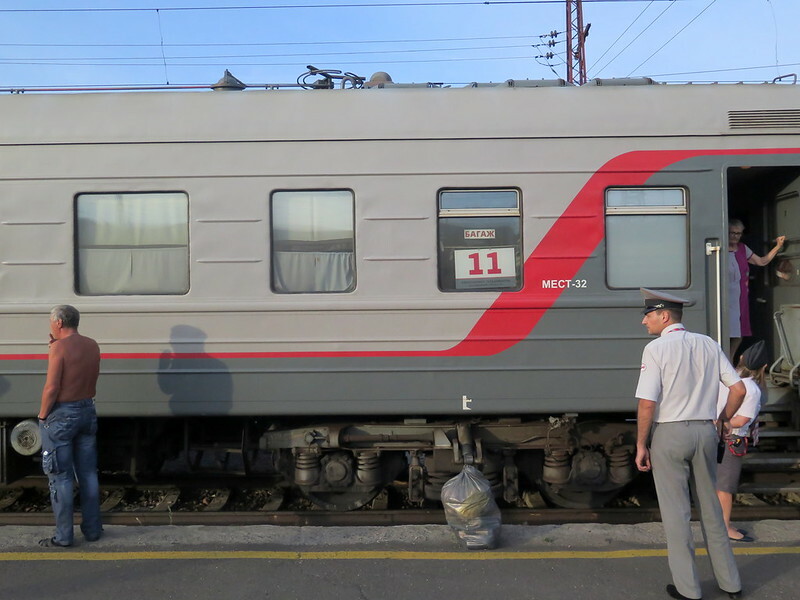 Today we bid farewell to Ulan-Ude and board the trans-Siberian railway westward to Krasnoyarsk. Our trip will last 26 hours, and we’ll be sharing our journey with two others in our cabin in kupe. Stoytcho is apprehensive about this, but it’s already a compromise; if I was choosing alone, I would’ve gone with plazcart, which consists of just rows of bunks with curtains for privacy. But as the train arrives and we watch the people piling into the plazcart cars en masse, I’m glad we went with kupe. We board after an attendant scrutinizes our passports, and we find our cabin, a tiny 7’ x 4’ x 7’ room that hosts a table and four bunk beds. There are two guys already in there, one older and one younger, and they fall silent as we walk in. Neither one is smiling. After we drop our stuff off on our bunks, we step outside of the cabin and Stoytcho gives me ‘the look’. “They don’t look friendly,” he sighs. 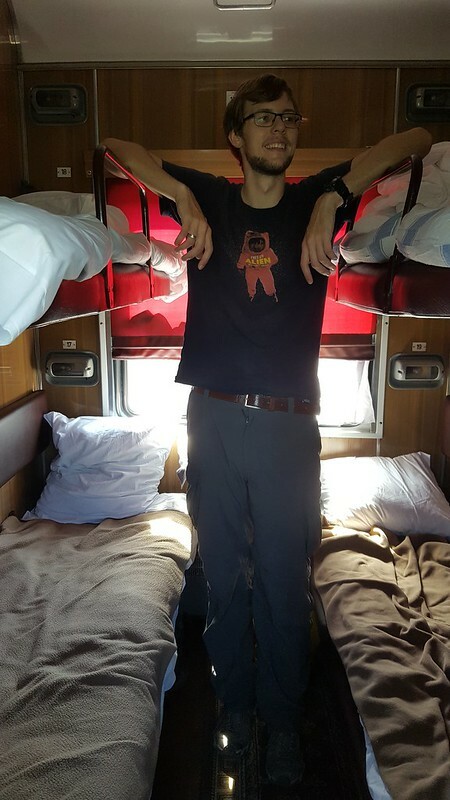 Stoytcho stands in our 4-berth cabin. Siberia is endless. 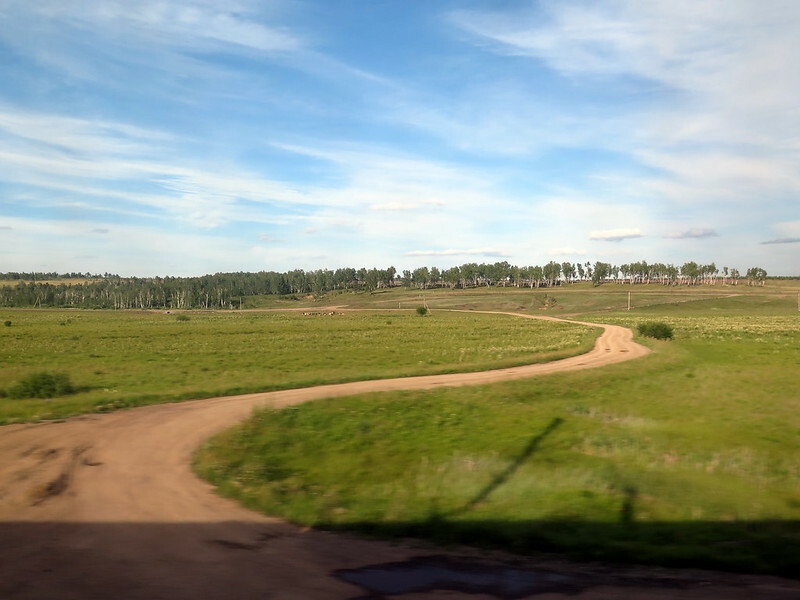 Our traincar glides through the landscape, and fields of flowers, open plains, and dense forests fill our window. I feel that if I could get out of our tiny room and run, I could run forever in any direction. A road winds through the Siberian landscape. 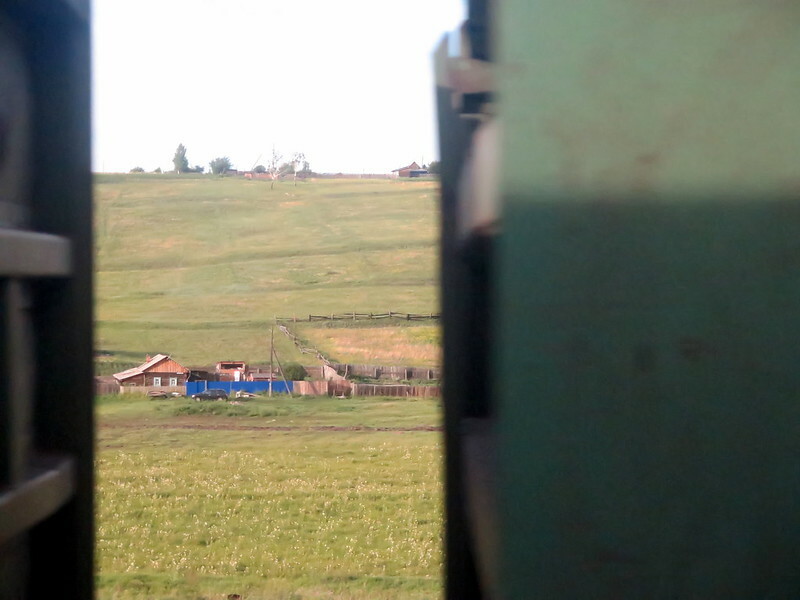 Occasionally we pass a house or small village huddled near the railway, usually old wooden structures with meticulously-painted accents and a vegetable patch nearby. Wires seem to extend from beside the tracks out to these houses—the electrical wiring running parallel to the railway appears to be their source of electricity. I wonder if it’s the only source of electricity out here, so far away from a major city. I wonder what the people do when it goes down. A lone house peeks between freight railcars. 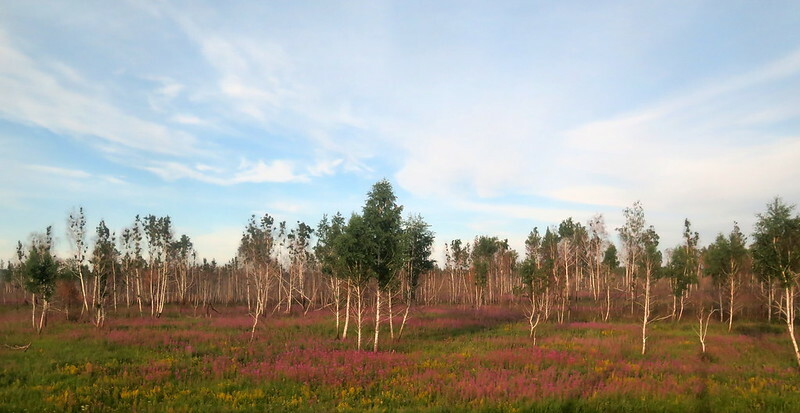 Birch trees stand in a field of blooming Ivan-chai. There isn’t much to do on the train besides sit and watch the scenery go by. 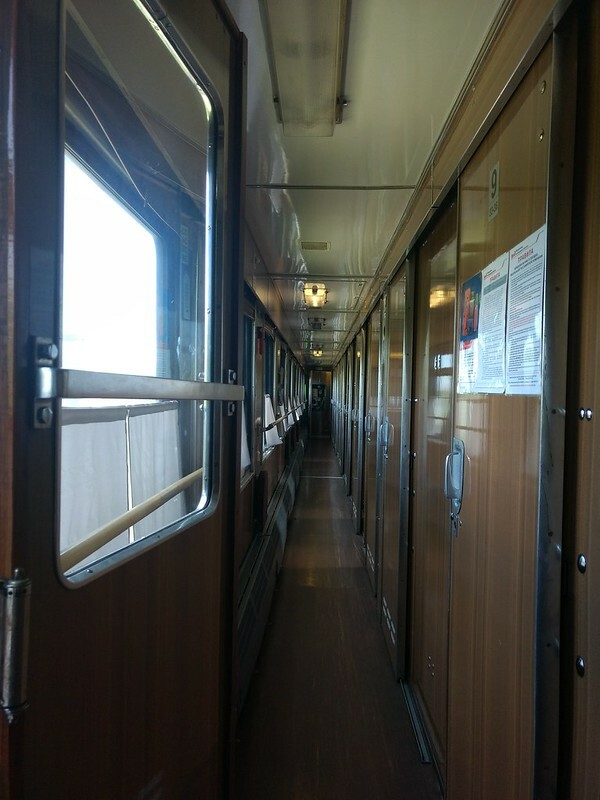 You can read, although the swaying of the traincar can give you mild motion sickness. You could write, but the jolts can send your pen scratching across the page. And you could use some electronic device of your choice, but the only outlets available for charging are found in the aisle outside your cabin. Instead, you watch the scenery go by and you have чаи (tea). 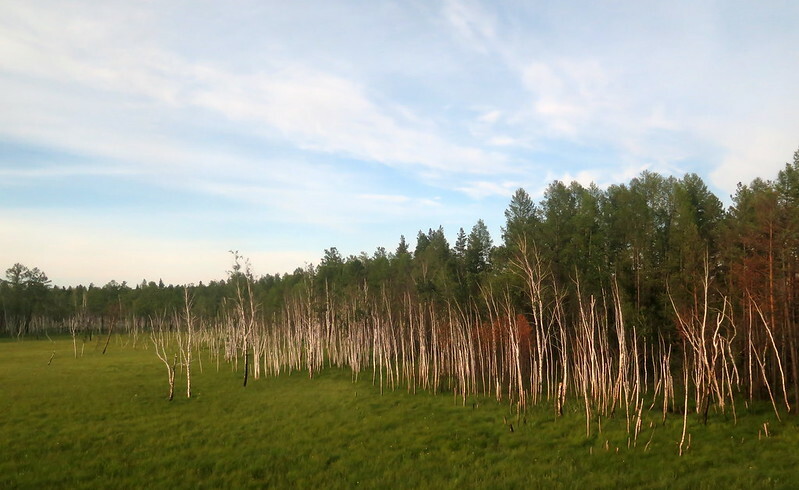 Snapshot of Siberia: pine forest (right) gives way to birch trees, then bog (left). 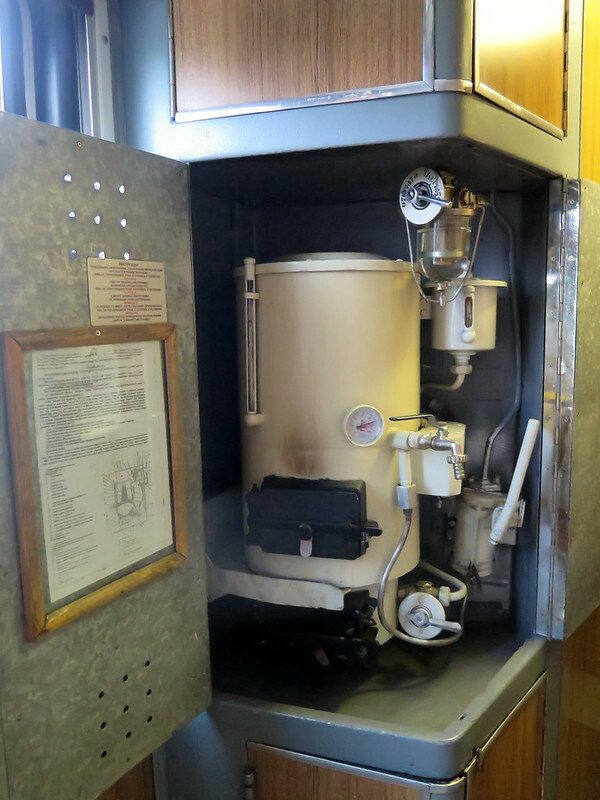 Every Russian traincar is equipped with a samovar, a hot water dispenser. The car’s attendant lends you mugs for free, which consist of a simple glass held in a gorgeously ornate tea glass holder (подстаканник). Add your own teabag and presto, you’ve got hot tea to sip as you watch the scenery slip by. Not knowing about this, we did not bring our own tea, but the older guy in our cabin pushes his boxes of teabags and sugar to us with gusto. “Please, help yourself,” he says warmly. We thank him and dip teabags into our cups, watching the dark color of tea ripple out into the hot water. 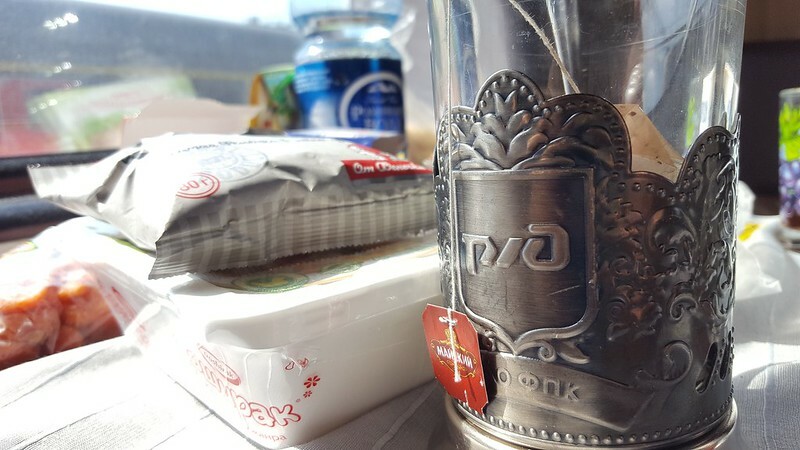 A podstakannik with tea and some snacks from our trip. Our cabin mates are Nikolaj, a younger man on his way to visit his sister in Novosibirsk, and Ivan, an older man homebound after a six-month work stint on electrical lines out in Siberia. I introduced myself as “Natasha” and Stoytcho introduced himself with his name. Ironically, it’s a funny name even here, although Nikolaj and Ivan recognize it as Slavic. Stoytcho explains that he was born in Bulgaria, but works in the U.S. now. The guys are evidently pleased that they’ve got a Slavic brother in Stoytcho, even if Russian and Bulgarian have only about 50% equivalence. Both groups struggle to find synonyms and simple words that might map complicated thoughts and feelings. 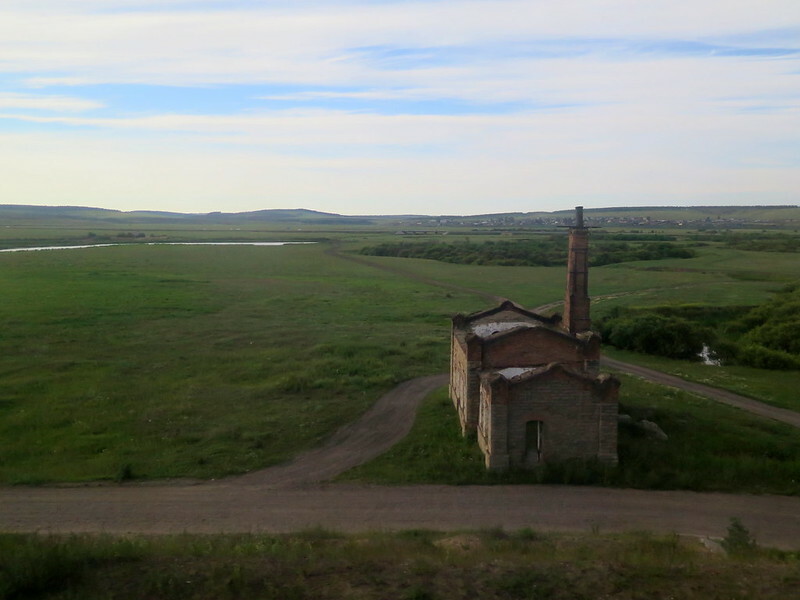 A building stands alone in the Siberian landscape. Some buildings standing near the rails appear to be old factories, perhaps abandoned after the fall of the Soviet Union. Nikolaj asks us if Americans hate Russians, followed by what we understand as, “If I travel there, will I be welcome?” We reply with “Americans don’t hate Russian people, it is the governments that don’t like each other. Big countries want to be the best. People are people, the rest is politics.” Both Nikolaj and Ivan nod, “It’s the same here. The government says that America hates us, makes trouble, sanctions. But the Cold War is over already. America won,” Nikolaj sighs with a laugh. “You should come visit us in America!” I offer helpfully. “Yeah, I want to try to visit,” he replies, smiling. Given U.S. visa costs and requirements, we both this is nearly impossible.